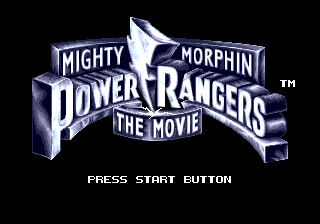 Mighty Morphin Power Rangers: The Movie for the Sega Mega Drive is a beat-'em-up game based on the film with the same name. Gameplay follows the standard set by games such as Final Fight CD and Streets of Rage. is for jumping, pushing rapidly is for attacking, holding it down results in a character specific weapon attack. is for an all around attack that consumes a bit of life. Double tapping a direction makes the character run. A timer is also present. When it runs out, the player character constantly loses health. Defeated enemies drop coins that restore health, add time or give bonus points. Some stages end with a mecha fight. In these stages is used for guarding attacks and dashing results in a character specific action. Developed by: SIMS Co., Ltd.
Main article: Mighty Morphin Power Rangers: The Movie (Mega Drive)/Magazine articles.